Interactive Lecture Series will consist of a series of lectures, each of which will act as a musical score, with the speaker, audience, space, and environment functioning as compositional elements. As talks are presented on various topics, members of OJO will take up position beside the lectern as the house band, using audio trickery to affect the audience’s reception of live speech. Focusing on specific words and phrases in order to induce listeners to react in all sorts of ways, their interventions should lead to chaotic and memorable lectures. OJO: Founded in 2005 by visual artists Joshua Aster, Justin Cole, Eamon Ore-Giron, Chris Avitabile, Moises Medina, and Brenna Youngblood, OJO is formed around a mutual interest in experimenting with acoustic guitars, electronics, musical spontaneity, freeform improvisation, and the boundaries between audience and performer. 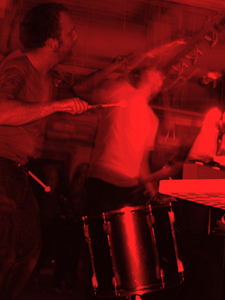 The group uses a wide range of instruments — drum machines, basses, guitars, synthesizers, salt, cars — as well as their own bodies and those of their audience, clapping, chanting, stomping, and singing to generate sprawling improvisations. OJO has created projects for Queen’s Nails Annex in San Francisco, Esthetics as a Second Language (available as a CD produced by James Welling), LAXART, BANK, Lizabeth Oliveria Gallery, and A+D Museum in Los Angeles. The group has also performed at the Hammer Museum, TRUDI, and Track 16, Los Angeles, and on KXLU 88.9FM. Engagement Party: MOCA’s Engagement Party presents new artworks in the form of dynamic social events and performances by LA–based artist collectives. Engagement Party is made possible by a grant from The James Irvine Foundation.